The Saturday will turn to Sunday in just few minutes. And yet, I can't sleep. On Friday my boyfriend got back from the army, but now he's sick. And I really don't want to go wake him up so I could sleep, so I guess I'll sleep at the living room then. Poor guy, he has to go back there tomorrow..
What have I been doing? Oh well, I got the second part of my driving license done. So now I don't have to worry about that anymore. Yay for that. Felt like going skeletal last Wednesday. This place is a mess, as you might see from the pictures too.. I just started cleaning today but I still have a loooonnng way to go. 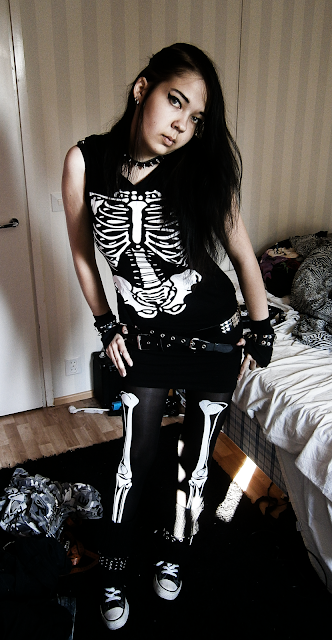 That Living Death Souls shirt I found from the fleamarket, with 4 euros. It has 2 parts, this web thing and the skeleton thing with a hood. Also these pants with 4 euros and this velvet shirt with 1 euro. Nice day for a fleamarket that was. I think I'll just curl up on this couch and sleep a little. Good night everyone. I love the way you dress!! !